You don’t need us to tell you that oven cleaning is one of the most difficult and messy jobs out there. but it’s important to tackle nevertheless. 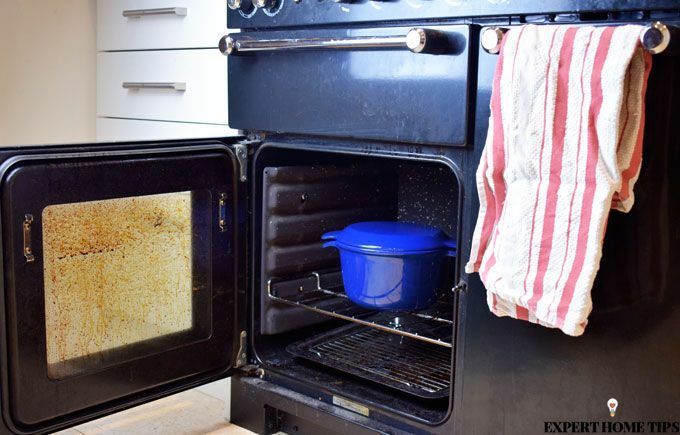 A dirty oven not only looks horrible but there are many practical reasons to keep it clean too. Old food stuck to the inside of your oven could be a fire hazard and may make your oven inefficient. Your food will take longer to cook and your freshly baked cakes could taste a bit funny too. Whether you’ve suffered a horrendous recipe mishap resulting in a serious mess or it’s just been a shamefully long time since you cleaned it last, it’s time to get down to business and get that oven clean once and for all. Luckily for you, we’ve got some easy peasy ways to get yours amazingly clean in a flash – they don’t call us ‘experts’ for nothing! Editor’s Note: This post was originally posted in May 2016 and has been completely revamped and updated for accuracy and comprehensiveness in January 2019. Begin by taking out all your oven racks to get them out of the way. Using a paper towel or old cloth, remove all those pesky little bits of burnt food from the base of your oven, wiping the bits straight into a dustpan pan or bin if possible. The more you remove now, the less you’ll have to get rid of later. Make sure your oven is completely cool before moving onto step 2. In a bowl, mix up 1/2 a cup of baking soda with water to form a paste. Spread the paste all over the bottom of your oven (avoiding the heating elements). I would advise putting on some gloves and using your fingers to make sure the mixture gets everywhere, including the really stubborn caked-on dirt! Meanwhile, time to think about those racks! This is an extra-special secret tip that will really work. Pour some washing powder into a bath of very hot water and put your oven racks into it overnight. All the grime will be easy to remove after a little scrub in the morning. Magic! If they’re not too dirty and you need your bath, try placing them in the dishwasher. Let the baking soda and water mixture do the work overnight while you rest and dream about how lovely and clean your oven will be. Use the same baking soda and water mixture you used for the inside of the oven and apply the paste to the inside of your oven window. Let it sit for half an hour then, using a cloth, wipe the window clean. Whilst you’re at it, you may as well give the stove top a quick once over. Scrub the top of your stove with the paste and wipe clean – easy! It’s time! Head to your oven and with a damp cloth wipe away the dried paste. Grab a rubber spatula if you need an extra hand to remove the paste. Finally, pour some vinegar into a spray bottle and spritz the areas that still have baking soda on them. Grab your damp cloth again and wipe the excess bits away. After a quick scrub of your oven racks, place them back in the oven.